The Short Version: Located between Austria and Italy, Slovenia may not be the first place you think of when dreaming of a romantic getaway, but this mountainous area is one of Europe’s best kept secrets. The capital city of Ljubljana is a particularly beautiful and lively place to spend time with someone special. You can tour historic castles, hike through mountain valleys, and cruise down the Ljubljanica River while soaking in the sunshine. The relaxed small-town atmosphere encourages visitors to slow down and enjoy recreational activities at their leisure. Slovenian ski resorts draw a lot of tourists in the winter time, but they also provide an intimate date spot during the spring and summer months. Couples can take a load off their minds while they explore the quaint city streets and breathtaking natural scenery of Ljubljana. The fastest way to reach this off-the-beaten-path herdsman settlement is by cable car from Kamniška Bistrica. You can find directions here. Couples can take the ski lift up to the snowy expanse and sled down the trails or ski down the slopes until the sun goes down. 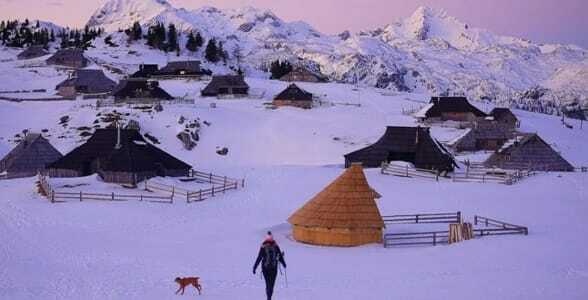 Velika Planina is home to one of the largest herdsmen’s settlements in Europe. The setting sun often makes the snow glitter and change colors, providing a lovely backdrop for a photo. If you want to surprise your date with a romantic weekend, you can spend a night on the mountain in a small wooden hut where a private sauna invites you to turn up the heat and relax after a day in the snow. This is just one of many romantic spots close to Ljubljana, a mountainous getaway tucked between Vienna and Venice in Central Europe. Slovenia’s capital city has become increasingly popular among European tourists who hope to escape big-city crowds and have a simple vacation in a historic and picturesque place. As Slovenia’s capital city, Ljubljana has a lot for visitors to see and do. 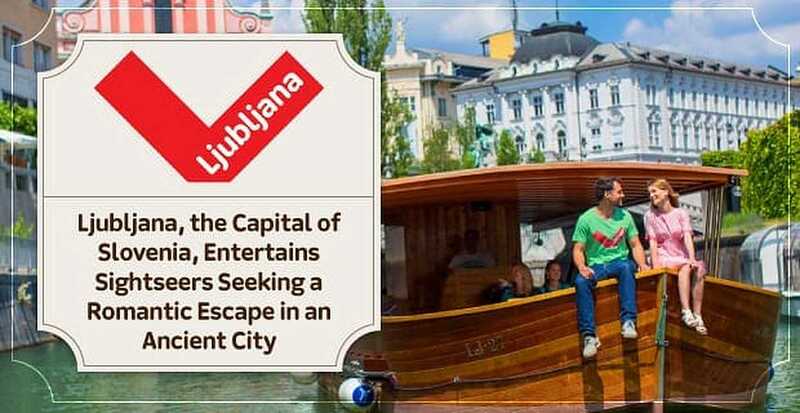 From touring a medieval fortress on Castle Hill to picnicking by a fountain in Tivoli City Park, Ljubljana has a lot to offer couples looking for romance. 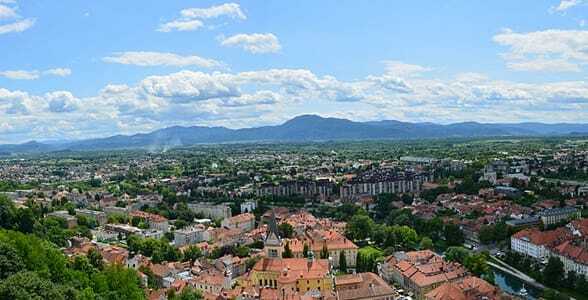 Although the city of Ljubljana has plenty of shops, restaurants, and historic landmarks to entertain visitors, the main draw for many tourists is the splendid outdoor activities surrounding the downtown area. Central Slovenia is famous for its mountain peaks and river valleys, and these natural places are worth exploring with that someone special. You can visit Vogel Ski Centre, located in Bohinjsko Jezero an hour away from the capital, to take it easy on beginner-friendly slopes. The resort offers 14 ski runs and cross-country ski trails as well as a ski and snowboarding school. These winter attractions stay open from the first week of December to the end of April. Even in the summertime, couples often trek up to Mount Vogel to enjoy the picture-perfect surroundings and hike up and down the mountain trails. The green season, as the locals call it, gives people a chance to explore the mountain at their leisure. You can take the cable car up the mountainside and admire the panoramic views of Vogel, Orlove Glave, and Bojinj Valley. The resort also opened a new mountain bike trail to get visitors’ blood pumping as they peel out on trails in the heart of Triglav National Park. Whether you’re staying at the resort itself or traveling from Ljubljana to the slopes, you’ll find fresh powder, breathtaking views, and a romantic atmosphere at Slovenia’s outdoor recreational areas. Ljubljana may be the largest city in Slovenia, but it’s hardly what urban dwellers would call a big city. Its tallest building stands at 13-stories tall, and its population has held steady at around 278,000 residents for the last decade. It’s an ideal destination for world travelers on a budget. According to TripAdviser, “This old town is a blend of Baroque, Renaissance, and Art Noveau buildings, watched over by a medieval castle.” The Ljubljana Castle is a notable landmark in the middle of the downtown area. Constructed in the 11th century, the medieval fortress now serves as a popular tourist destination and wedding venue. The city’s tourist boats can take up to 32 guests at a time along the Ljubljanica River. Tours run every day at 1 p.m. and 3 p.m.
Another way to see the sights in Ljubljana is by taking a guided boat tour through the city. Such romantic excursions provide an easy and relaxing way to tour the area with a date. As the boats wind through the quiet waterways, you can sit back and appreciate city’s unique architecture and atmosphere. You might even pass under Butcher’s Bridge, a visually striking bridge on the Ljubljanica River. Since it opened in 2010, young lovers have made a special trips to this footbridge to place a padlock on the parapet and drop the key into the river as a symbol of their commitment to one another. All along the steel-wire railings, you can see hundreds of padlocks etched with hearts, initials, and love notes. Ljubljana has many scenic spots to take a date, and that makes it perfect for a romantic getaway. Couples can partake in simple pleasures surrounded by cultural diversity and abundant greenery. If you like to immerse yourself in the culture of the places you visit, you can visit the local attractions of Ljubljana and learn about its history. Ljubljana has many longstanding museums, including the National Museum of Slovenia and the Museum of Modern Art. Founded in 1821, the National Museum of Slovenia is the oldest museum in the country and remains a bastion of cultural heritage for the Slovenian people. Its exhibits highlight the country’s long multi-cultural history. Visitors can attend lectures, take a guided tour, or walk through the galleries on your own. The museum’s extensive collection includes the oldest musical instrument in the world: a 60,000-year-old Neanderthal flute made from the femur of a bear. Meanwhile, Ljubljana’s Museum of Modern Art is home to hundreds of 20th-century Slovene paintings and sculptures. Its rotating exhibits feature the works of different contemporary artists, so you can discover something new on each visit. The museum is open to the public from Tuesday to Sunday. 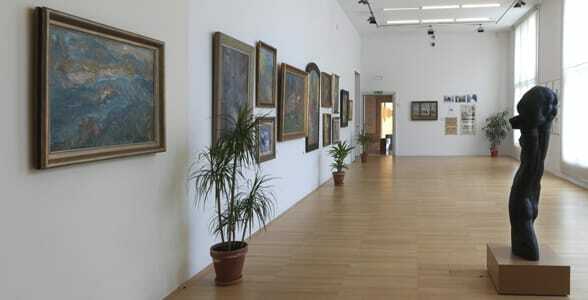 The Ljubljana Museum of Modern Art has an impressive permanent collection of 20th-century Slovenian art. Of course, museums aren’t the only way to explore Slovenia’s culture. Over 10,000 cultural events take place in the city every year, so visitors can always find a theatrical, musical, or artistic celebration in the city streets. You can check the events calendar (sorting by festivals) to discover opportunities to sample live entertainment and local cuisine. Visiting couples may also enjoy taking a walking tour of the city’s major attractions and historic sites. A knowledgeable guide can fill you in on the rich history behind some Ljubljana’s oldest landmarks. Whether you’re interested in architecture, Roman history, or local traditions, these tours will satisfy your curiosity and give you and your date something to discuss as you stroll from place to place. Known for its beautiful mountains, historic sites, and friendly people, Ljubljana has a lot to offer visitors looking to get away for a day, a weekend, or even longer. The city is a hub of cultural events and authentic cuisine, and its surrounding area provides plenty of recreational activities to satisfy outdoorsy couples. You can abscond with a date for a daytime boat cruise down the Ljubljanica River or a nighttime sledding session on Vlika Planina. Wherever you go in Slovenia’s capital city, you’re sure to have a wonderful time exploring the sights and reconnecting with your partner.